RIBBON BARS, all countries, all time periods, but especially German 1897-1945. Imperial German officers biographical research from documents, photos, and 'anonymous' medal bar and ribbon bar combinations. Into Third Reich for senior officers. Democratic Republic of Georgia 1918-21. Turkey 1914-18. Finland 1918-44. Soviet award groups, officers' award research, and uniforms 1935-1968. Soviet groups and research on "advisors" 1950+. Civil police in any totalitarian regime. Unfortunately no. He was an exact clone for the American gay writer Gore Vidal, though. I was HOPING this would be easier than it turned out to be, but no such luck. That's the problem with Imperial enlisted men. There are no awards given in the R.A.D. Seniority Lists and nobody with a truly weird enough name to "know" that had to be THE one. For instnce, there was an Oskar Beyer who got the PrGMVK as a medical NCO...but no way to determine from what I have (Ptazwall's PrGMVK list) if he was the Oskar Beyer who was an R.A.D. Oberstfeldmeister in 1938. Even if his arm shield showed numbers, that might have been a help. Oh well!!!! The World's Most BIZARRE Award-- A New Chapter! I would say that is the Prussian Golden Military Merit Cross-- the Pour le Merite for enlisted men. It started to be a fashion in the Third Reich to wear that from the buttonhole--never like HE is though just to not "lose" it in a medal bar. I have never checked PrGMVK recipients against the junior RAD officers Dienstaltersliste--I will do that today. Here he is (top entry) from the 1905 Ordensliste, Nachtrag 2: Funny but I never thought of military railway in Southwest Africa then! OK, if these are your "bits and bobs" now show us the GOOD stuff! Hadn't paid attention to this from the thread title. You've got a fantastic range of medal bars--how long have you been collecting these? The only Fritz von Otto I find was a technical officer in flying corps WW1 *1887, awards do not match--so if he WAS that "Oberst" he would have been Luftwaffe The only Böhlers who turn up were Badeners--no match Wahls certainly came from Württemberg, but I find no Eugen. There were Karl, Otto, and Wilhelm with WF3bXs, and Kriegsgerichtssekretär who could not be that man. Your non career officer looks like he was in artillery, maybe, from the Waffenfarbe shade on his insignia. For a non-career Major he was probably a char. Hauptmann aD after the First War. 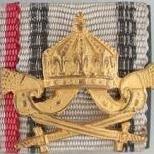 I agree that is a WW2 Rumanian "war ribbon" used on most Orders, in his burttonhole. Classic so-called 3rd Class !!! Oh, make me weep!!!! Such things NEVER get over here! Is there an award DATE on that last one.. or did they forget in all the artwork? "If it's in a museum, it stays there, and the story is preserved a lot longer and more securely than any one of us in the family could preserve it." Actually, far more often than not: dumped in storage, forgotten, lost, stolen, or ...thrown away AGAIN. As--is far far more common than nice, well-meaning people would like to believe--are medals very deliberately chucked out in yard sales because the "near and dear" don't give a damn, either. Sadly, all too often the only people who DO care are... collectors. They are paper... in cardboard boxes in the attic... or cellar... somewhere. Pre-internet Old People stuff!